New York was cold. Very, very cold. Like “are you kidding me” cold. It was so cold that doing anything other than go inside somewhere warm was a ridiculous prospect. 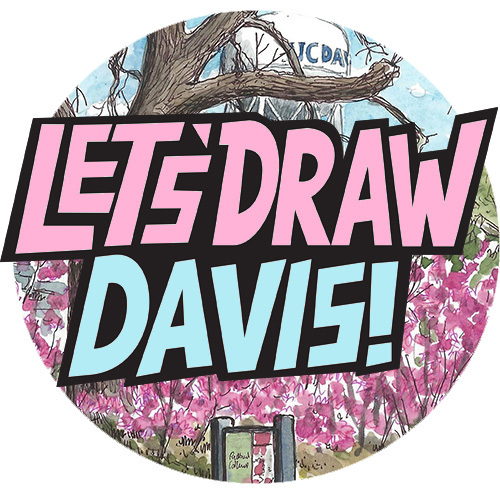 Not to say that I didn’t, and you will see an actual sketch I did outside in the next post. We also walked through Central Park which was beautiful, if somewhat frosty agony afterwards. The sort of cold where you go home and open the fridge to warm up. 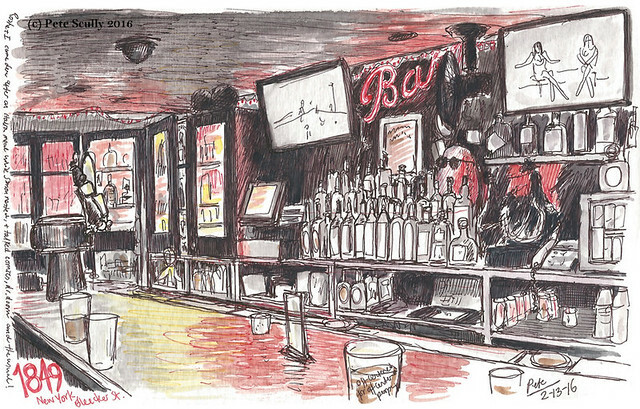 Fortunately New York has a proliferation of bars, and here are a couple more sketches of some. the one above was McSorley’s Old Ale house, another ‘oldest’ New York drinking establishment, established in 1854. Ah, ’54, what a year. That was the year old Fernando Wood became the mayor, a big player in the Tammany Hall political organization. New York had seen a big influx of Irish immigrants in the decade prior, escaping the Potato Famine. 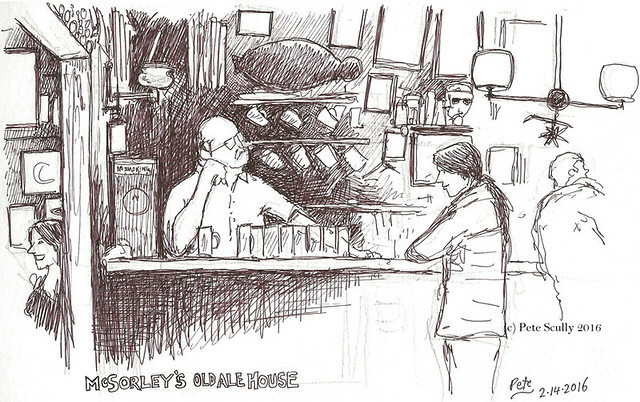 McSorley’s is old and feels it, but bustling and full of life for an old geezer. Sawdust is all over the floor, and the beer comes in pairs and is good – you can get two kinds, light or dark. Don’t fanny around. Despite being as cold as one of the moons of Jupiter outside, it was packed with people, a busy Valentine’s Day crowd. We stood at the bar until a table opened up, then warmed up with soup and a bit of sketching. Oh and lots of silly voices. Have you seen ‘The Trip’ with Steve Coogan and Rob Brydon? Very much like that, doing the Michael Caine / James Bond voices, but greatly expanded in repertoire. Imagine Caine as Han Solo saying “Don’t Get Cocky!” and you get the idea. It was most enjoyable fun, though maybe less so if you were sat next to us. I sketched this far, and then we moved on. This next bar, visited the evening before after a lovely Italian meal in Greenwich Village, was on Bleecker Street and was called “1849”. Ah, ’49, what a year. Back in California, the Gold Rush had exploded, and people packed up and dashed across the country to make a few quick bucks in the sunshine. Back in New York there was a cholera epidemic, and a huge riot in Astor Place between people who thought one famous actor was better than another famous actor. they hadn’t even heard of Michael Caine at that point, if they had history may have looked very different. This bar wasn’t around in 1849 of course, in fact it is just a themed bar-restaurant that takes its inspiration from the Old West. I don’t know if they had potatoes with sunglasses on in the Old West but I’m pretty sure that was what was sitting behind the bottles behind the bar (people probably said the same about me to be fair). Lots of red light. Not a hugely warm place if I’m honest, nowhere near the character McSorley’s has, but the beer was nice. It’s the warm, respectful service that’s McSorley’s so great!